In a week when the American president has decided our energy policy should involve lots more offshore oil drilling, it’s easy to despair–it doesn’t look like it’s going to be much of an Earth Day in the U.S. this April. 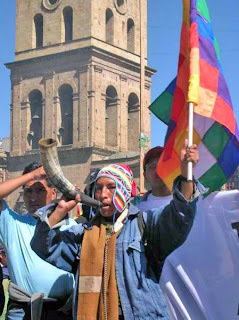 But maybe we’ll get a jolt of political energy from the south, courtesy of the groups and leaders assembling from across the world in Cochabamba, Bolivia. This People’s Summit on Climate Change will be seen as naive by precisely the kind of people applauding the president for turning on the oil spigots today–after all, its by definition a People’s Summit, free from the kind of corporate interference that helped sink the Copenhagen conference in December (Bolivia’s Supreme Court having not yet decided that corporations are people).Copenhagen was marked by a focus on power politics, not science. Though 117 nations endorsed the 350 ppm co2 target that researchers say is necessary to ward off the very worst effects of climate change, they were the wrong 117–the poor nations, the most vulnerable nations. The real addicts–led by the U.S.–simply weren’t ready to come to terms with their need to dramatically cut emissions, and so the session ended with a whimper, the so-called Copenhagen Accord which promises nothing, enforces nothing, accomplishes nothing. The failure of those talks does nothing to slow down the progress of climate change, of course. This is a fight between human beings on the one hand, and physics and chemistry on the other–and physics and chemistry don’t really bargain. So glaciers like Bolivia’s Chacaltaya continue to disappear, and Arctic ice to melt, and seawater to acidify. We don’t have all the time in the world–we don’t, in fact, have a moment to spare. Thank heaven, then, for the nations like Bolivia willing to work alongside civil society (instead of lock normal people out of the hall, as the UN did in Copenhagen). In fact, “work” is the key word for this year. At 350.org, we’re organizing a huge Global Work Party for October 10 (10/10/10!). All over the world, thousands of communities will be putting up solar panels and insulating homes and doing the other things we must do to deal with climate change. Our message is not that we can solve global warming one nice project at a time–we can’t. Instead, our message is: if we can get to work, so can our lawmakers. If we can climb up on the roof and install solar panels, the U.S. Senate can do what it’s supposed to do, and the UN General Assembly, and everyone else who needs to actually get to work. That process begins in April in Bolivia. The world’s leaders haven’t led, so we’re going to have to lead for them. It’s going to be a fight, and it’s on now. Bill McKibben is founder of 350.org and author of the first book about global warming, 1989’s The End of Nature.